Dr. K.Shruditha Kadevari is one of the best Dentists in Domalguda, Hyderabad. She has had many happy patients in her 15 years of journey as a Dentist. She has completed BDS . You can meet Dr. K.Shruditha Kadevari personally at Dr.K.shruditha in Domalguda, Hyderabad. 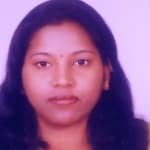 You can book an instant appointment online with Dr. K.Shruditha Kadevari on Lybrate.com. Lybrate.com has an excellent community of Dentists in India. You will find Dentists with more than 25 years of experience on Lybrate.com. You can find Dentists online in Hyderabad and from across India. View the profile of medical specialists and their reviews from other patients to make an informed decision. I have small tooth abscess in my mouth And I found on a google there is the only treatment for a dental abscess that is Root canal so I just want to ask that what is the cost of root canal treatment? Leave about the cost but first get to know what are the condition of abscess .at times rct fails when you do not know the procedures to treat abs. Mere mouth se brush krny k baad bhi early morning ya kuch khau turant smell ati hai what can I do. your problem is related to underneath the gums so once get scaling done and than use some less chemical toothpaste like meswak. Having problems in my gums and reason being am facing bad smell issues in my mouth. Am 26 years old. please do suggest better tips to overcome this. 1st suggestion is visiting dentist to get your teeth cleaned than still the problem exists than go for gum surgery. I have yellow teeth. Is bleaching is good. M 41 year and my teeth is very sensitive. For sensitive teeth bleaching is not prefered coz bleaching is an agent which contains acid so there r chances of oversensitivity. Yellow teeth you once use this toothpaste twice a week -snowdent. Is there a natural remedy for yellow teeth? Will it make a difference if I quit having tea and coffee? My teeth are slightly nodding. Not too much. It's very little. If I wag it I feel it's not strong. There is no bleeding or broken teeth. What should I do now? I am 20 years old. I am 21 year old girl m having problem in my teeth also having bad smell from mouth too ll you plzz sugest me medicine to treat bad smell. I m 35 year old I eat gutka from last 18 years regularly Now want to stop itAnd want my teeth to be stain free what to do to get my teeth clear. Dental scaling 2 sittings but after scaling don't start again eating gutka and cancer is at high risk so please think about your loved ones before you start that habit again.